"I would classify your product alot higher than neat!!! I was very impressed with the quality and attention to detail. I know that I sound a little like a salesman when talking about the urn, but I was very impressed and feel that anyone that has cremated a loved one, would be very happy with keeping there memories in your urn's!!!!!! I did have a little problem deciding on the urn to use, some of the other ones I looked at made it hard to make a desision. 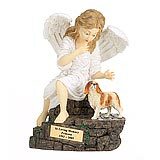 I was also thanking about one of the angels to place out side but stayed with my original choice due to my pet being an indoor dog." 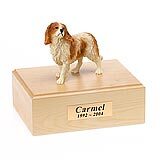 All available King Charles Spaniel dog urns and memorials will be displayed with the figurine on the King Charles Spaniel urn you select and in the appropriate size.